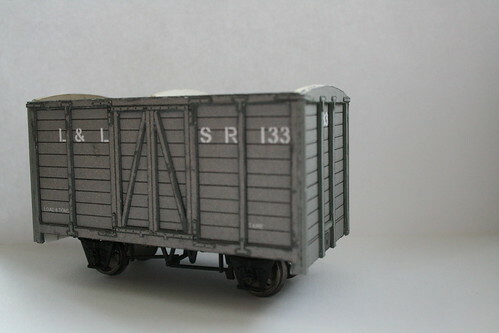 I was a little bit sceptical about the results a card kit would give, despite a long history of the material in railway modelling, but hopefully you’ll agree that Londonderry & Lough Swilly Railway van no. 133 here has come out pretty well. It is 5.5mm/ft scale, resized from an OOn3 range by Hamlin Industries, and runs on a shortened Hornby “Rudd” chassis which would benefit from some smaller wheels but is otherwise a fairly good fit. The advantage, of course, of modelling 3′ gauge in this scale is that the 16.5mm running gear from the wide world of OO is available for re-use. As the van is printed in full colour it can skip the painting stage where projects often flounder, although some weathering to reflect the pretty grotty condition most vehicles of this type ended up in will be neccessary. To give the framing and strapping some relief, the sides and ends are built up with laminations and for strength the whole thing is stuck to a core of 1mm thick mount board which gives a surprisingly solid structure. It has been strategically weighted with some old lead flashing inside the body, all that remains is to stick a roof on and (done!) take it off to Narrow Gauge South West at the weekend for inspection by other members of the 5.5mm Association. I have a few more card vans of other diagrams to make, hopefully now I have the technique down they will emerge before long. This entry was posted in 5.5mm, irish, kits, model railways, narrow gauge. Bookmark the permalink.